Small La Laguna Beach fringing palm trees and white sand. Small La Laguna Beach in Puerto Galera has Sabang Beach on the one side and Big La Laguna Beach on the other. Access to the beach is pretty simple, you either come by private banca direct to Small La Laguna Beach, which will drop you exactly at the doorstep of your hotel or you can catch ferries to Puerto Galera and then transfer. Have a look here for information on getting to Puerto Galera and here for information on how to get to Sabang. Small La Laguna Beach is exactly as it is named, small. 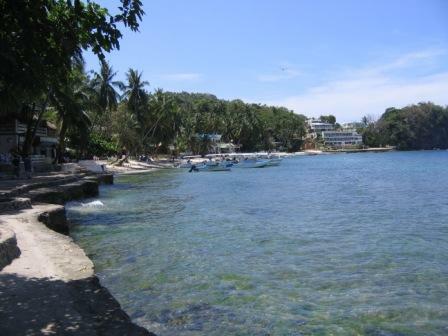 It is the smallest beach of the three beaches, Sabang, Small La Laguna and Big La Laguna Beach. Of the beaches the less crowded would have to be Big La Laguna Beach. At high tide expect to get your feet wet as you travel from one beach to the next. Small La Laguna Beach Puerto Galera is cove shaped with fringing palm trees, what else would you expect in a tropical paradise? Kind of stating the obvious. If you look close at the photo above you can see a huge hotel at the end of Small La Laguna Beach, to the right of the hotel as you look at the photo is where you follow the path to climb over the point to Big La Laguna Beach. The pathway in the foreground has come from Sabang and weaves over the point which separates these two beaches. The beach at Small La Laguna is not a beach for sunbaking or lazing around on, it is just to small, that is the distance between the walls of the resorts and buildings and the water line. If you want a beach to enjoy try Big La Laguna Beach, it is only a 5 minute walk. Small la Laguna Beach is ideally located, you are close enough to enjoy Sabang yet far enough away to not feel too claustrophobic by the nightlife. If you don't go anywhere in Puerto Galera make sure you go to the Point Bar. 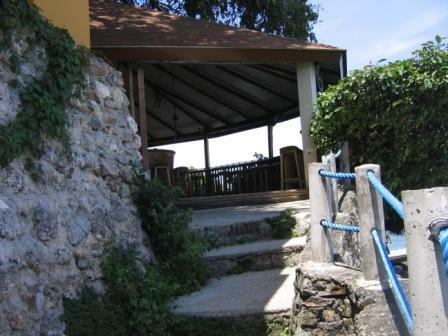 This bar on the point dividing Sabang and Small La Laguna Beach, overlooks the water and has views to die for. It is truly spectacular. It is on one level with a long narrow table with bar stools facing the water at one side and the bar at the other. It is nice and open and catches the sea breeze, which brings a welcome relief to the humidity. All bars in the Philippines are equipped with a large bell, with a rope, if you ring the bell you better either choose a day when the bar is empty or have deep pockets, because you have just shouted the bar! Many have come unstuck late at night with a few too many under their belt, thinking it is a good idea to ring the bell, only to regret it the next day. The one hotel that constantly gets great reviews from guests is the Portofino Beach Resort. It is located pretty much in the centre of Small La Laguna Beach and is raised slightly off the beach. In the front of the resort is swimming pool, complete with a bar and restaurant to help you through the day. Deck chairs and lounges allow you to watch the sunset over the water at dusk. Have a look here for more information on the Portofino Beach Resort.